Yesterday was the premiere of Discovery Channel’s Life and I was honored to tweet from their account @lifeondiscovery through the first episode “The Challenges of Life”. It was an incredible experience! I loved knowing that there were thousands of people watching the show and marveling at the wonder of nature and wildlife. I also loved promoting the beautiful production, but most of all it was fun to watch so many people happily discussing nature on the twittersphere. Cheetahs: these speedy creatures can’t bring down a large animal on their own. But when they hunt together (you can watch the cheetah vs. the ostrich clip) they are much more likely to catch and take down large prey. You can even take the “Hunt Like a Cheetah” Quiz. Panther Chameleon: their color changing capability isn’t the only thing that makes them cool, they also have strong tongues that catch insects from long distances! Venus flytrap: This carnivorous plant uses sugary nectar to lure flies onto it’s trap, and if the fly touches two of the fine fibers within twenty seconds of each other the plant will close its leaves rapidly. Ibex: their skill at rock climbing and maneuvering steep ledges makes them hard prey to catch! Even a 10 day old ibex managed to out climb a red fox. Sardines: they pack together to avoid predation– gives a new meaning to packed like sardines! Flying fish: they move their tails 70 times a second and can glide up to 600 ft! Crabeater Seal: they are said to be the second most numerous mammal on the planet (next to humans) and are very smart and quick! 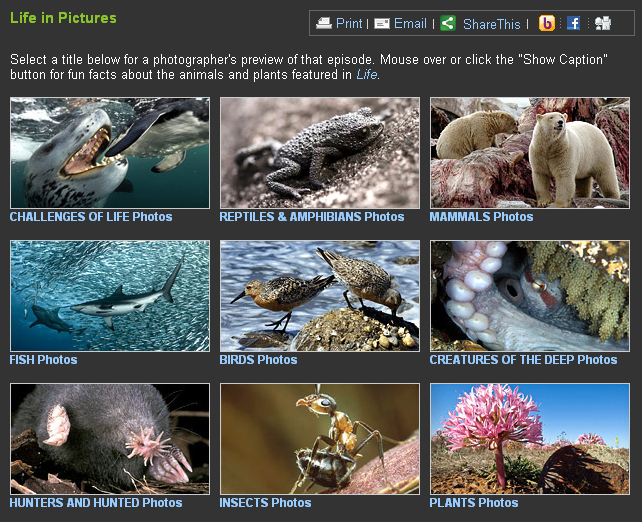 There are many more animals discussed in the episode, but by far the most rewarding thing for me was to watch the twitter stream fill with people’s questions and reactions to the beautiful footage and the amazing facts introduced. It’s wonderful to witness people in awe of nature and with technology and social media, the whole experience becomes a social event. 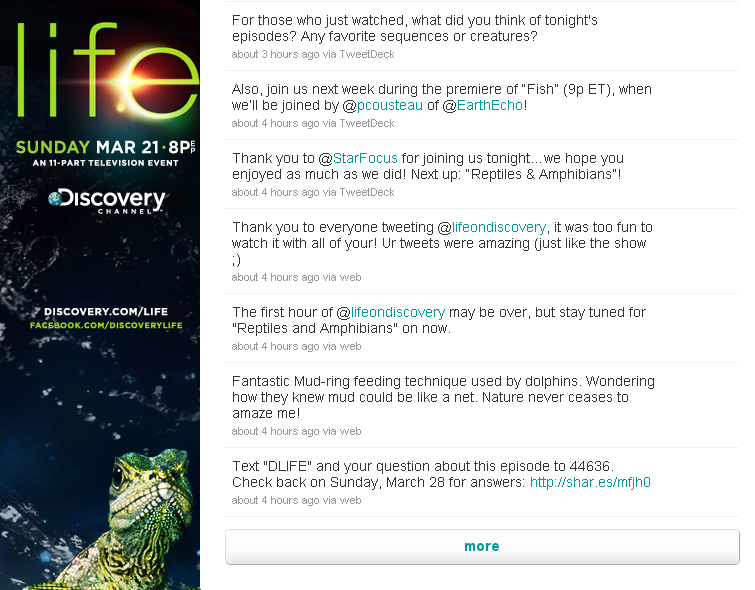 I absolutely loved what discovery did for showcasing the conversations on Facebook and Twitter. They were able to observe people commenting while also displaying their responses on the Life website. 2.) Conversation Feeds that pull in from Facebook and Twitter. This is just awesome! While we haven’t figured out how to do this at the National Wildlife Federation, watching how Discovery did it for the Life premiere was impressive. Definitely gave me ideas for how to combine social conversations in one readable platform. 3.) Connected with and following people who mentioned they were “watching Life” was not only smart social media use, but it got people to sites that they wanted, while also making them feel like they were part of something much bigger! The Life watching event trended worldwide on Twitter for a majority of the first episode. In case you can’t tell, I’m impressed with the whole experience, but mostly I was just excited to connect with passionate people using technology– who care about…well of course… the natural world! The dancing birds were grebes! In fact, I think they were western grebes! Either that or clark’s grebes! We had the whole family tuned in as well – reminded me of growing up when my Dad had us watching Mutual Omaha’s Wild Kingdom – not the episode, just the experience. The flying fish were a thrill to watch.